The beauty of salads is that they are easy to make, cheap, great to experiment, easy to digest and healthy. Do you like to eat a lot of tasty food? What about your weight? Are you scared to become overweight? We offer you a great alternative to delicious but heavy food – salads. They are tasty, vibrant, healthy and easy to make. Let’s talk about summer salads. It is very hot now in most parts of India! 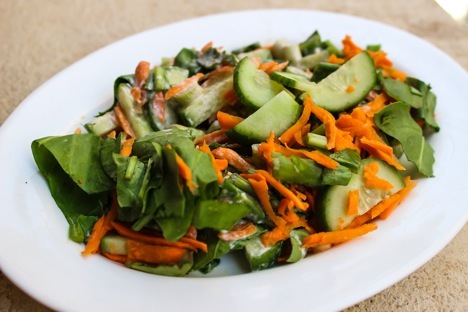 Most people don’t feel like eating heavy oily meaty meals, making fresh vegetables salads are a much better option. There are thousands of recipes of Russian salads. Summer is short over there and Russians try to make the most out of it. In the winter we don’t get a lot of fresh vegetables. During the summer though, the variety of vegetables offered in the market is endless. In India, on the other hand, we are lucky to have beautiful, fresh vegetables and fruits throughout the year. In my humble opinion, my fellow Indians don’t use enough fresh uncooked vegetables in their diet. In Russia, when there are fresh vegetables available from the garden, people prefer to eat them without any cooking. Of course there is nothing special in eating raw tomatoes, cucumbers and capsicums. What about cabbage? Or spring onion with salt? Or raw garlic? At one of the parties here in India, I decided to prepare a very common appetizer from Russia. Basically, it is grated cheese with raw garlic and mayonnaise which is applied on tomato slices or boiled eggs. It’s sometimes it is called ‘Jewish salad,’ although I have no clue why. Knowing how much my Indian friends like spicy food, I put a very generous quantity of raw garlic. To my surprise, people found it almost impossible to eat due to the strong garlic flavour. The beauty of the salads is that they are easy to make, cheap, great to experiment, easy to digest and healthy. Even if you have unexpected guests, there are always enough ingredients in any household fridge, to quickly make the salad and impress the guests. Try, experiment, enjoy and be healthy! Peel the carrot and grate it. Add chopped spinach leaves, thin slices of cucumbers and spring onion. Mix everything, season with salt, sugar and add dahi. In the original recipe, the dressing is made of sour cream. I find dahi a reasonable substitute and much healthier. Garnish with fresh herbs when serving. Slice cucumbers, capsicum, cut tomatoes into semicircles, finely chop garlic. For dressing squeeze lemon juice, mix it with olive oil, salt and pepper to taste. Everything mix very well and serve with chopped fresh coriander leaves.